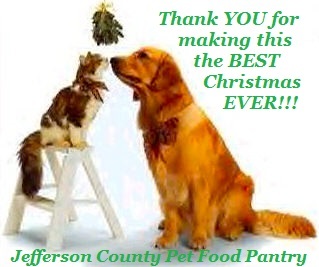 Jefferson County Pet Food Pantry : Our Christmas Pet Food Distribution Was The Best YET!! Our Christmas Pet Food Distribution Was The Best YET!! WOW!! On Sunday Dec. 20th, 2015 we gave away 2,120 lbs of dog food, 762 lbs of cat food, hundreds of canned food, litter, toys and treats yesterday. Thanks to everyone who donated, made/donated toys, bagged pet food and treats. Thanks to the donor who gave us the coolers and to Tina L for making 3 feral cat shelters we were able to give away. We had tubs of toys and treats! ...and we signed up 7 dogs and 11 cats to get fixed!! Most of all thanks to the hard working, dedicated volunteers who give their free time to make this happen!